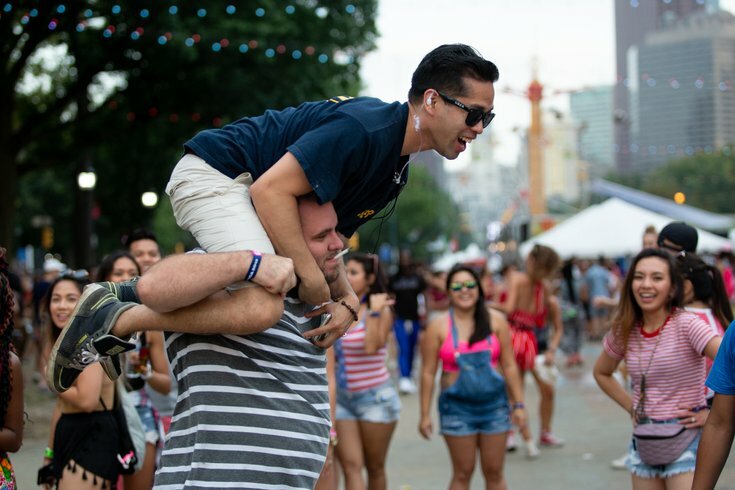 Adrian Macandlie sits on top of Billy Bonka's shoulders at the Made in America Festival in Eakins Oval Sunday, September 2, 2018. A few days before the Eagles started their 2018-19 season in the same fashion they ended the Falcons' 2017-18 season, I saw something I hadn't seen since February. It was the Eagles flask which I tucked away in a winter jacket worn to the Ben Franklin Parkway for the best parade in Philadelphia history, and there was still some vintage Fireball therein. After contemplating the wisdom of drinking eight-month-old cheap cinnamon whisky or whatever Fireball is (it got dumped down the sink as "Taps" played, hand over heart), I thought back to that day's good vibes. Among the highlights evoked were videos of police dancing at the parade and how, in my estimation, they humanized an oft-villanized profession if only for a few seconds. That the flask wasn't seized, and the event went smoothly to the tune of very few arrests, helps, too. That day, however, was apparently an anomaly as far as police intervention at large-scale gatherings go. Take last weekend's Made in America Festival on that very same Parkway, for instance. Police wrote more than 150 citations: 145 for underage drinking, eight for violating the weed code and four for public drunkenness. This is kind of par for the course insofar as summertime gatherings in the city, so I'm not going to sit here and take up the cause for any of those alleged lawbreakers. I get it. We're a nation of laws, and without order (like, say, Officer David Pownall having to answer for his alleged crimes), society could crumble and yadda yadda yadda. But I want you to think about this, flask thieves in uniform: The only people who benefited from your amazing discoveries on Saturday and Sunday were the booze vendors – $14 per cocktail and $8 for a 12 oz. beer – inside the fenced-off concert area. Woo hoo, two less people with a couple drops of alcohol entering an event with droves of alcohol available. I'm not a cop so I don't like telling them how to do their jobs, but that good old "don’t they have anything better to worry about" line comes to mind. Like, say, the rising homicide rate amid a diminishing budget for those charged with investigating them? Or, say, protecting horses outside a Thursday night Eagles game, where people started drinking in the morning? Or working on your dance moves? After all, those videos did some reputation good to the department's reputation back in February. Still, if they're gonna seize roadies and flasks outside a summer concert and boast about it like they're passing out victorious Electoral College maps, I'd like to see this enhanced version of public protection and service make its way to Broad and Two streets on New Year's Day. Now those are cheeky, humblebrag social-media videos that I'd love to see.